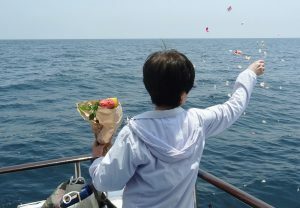 scatter their ashes, will be meaningful, memorable, heartfelt and dignified. It is a fantastic opportunity to give them send-off they would have wished for. If your loved one was religious you can ask the faith leader to preside. However, if the person wasn’t religious then it is entirely up to you, which has its own advantages and disadvantages. On the plus side you can spread the ashes in a way you see fit, however with no tradition to lean upon you may be left wondering what the ceremony should involve. I’m not afraid of death. It’s the stake one puts up in order to play the game of life. ~ Jean Giraudoux.